Sexual conflict describes a scenario in which the males and females of a species have competing strategies for reproductive success. An extreme example of sexual conflict is sexual cannibalism, a remarkable phenomenon that has most commonly been observed in insects (praying mantis), arachnids (black widows), and amphipods (Gammarus pulex). In conventionally sexually cannibalistic species, the male is under severe threat from the female during and after the mating process. Rare examples of reversed sexual cannibalism, as in G. pulex males, have also been observed. As such, the adaptive value of sexual cannibalism has been a source of much controversy. While a leading hypothesis assumes that males are a significant source of nutrition for fertilized females, cannibalism of the female by males in species like G. pulex provides a challenge to this theory. 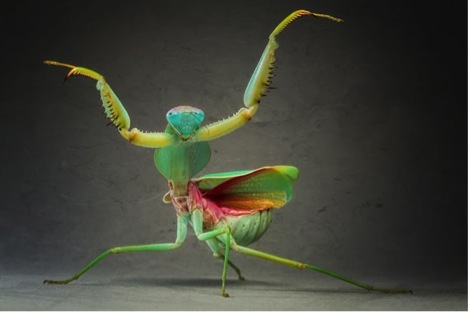 Praying mantises, belonging to the Mantodea order, are a great model for studying this behavior. They are highly predatory, feeding mostly on insects and even their siblings. Using their cleverly adapted coloration, they camouflage themselves very well and mostly hunt by ambushing their prey. While small insects form the majority of their diet, large prey like frogs and scorpions are also known to be targeted. Since mating incurs significant reproductive costs on the female, cannibalizing the male can be an effective feeding strategy. The next few pages provide a much more detailed story on the mechanism (how the mate gets cannibalized), development (how the behavior develops over the organism's lifespan), evolution (the history of sexual cannibalism in different species), and survival value of this rare but amazing behavior!